Imbued with an enchantment of ice, this skin binds dragons in icy bonds and leaves behind some serious frostbite! 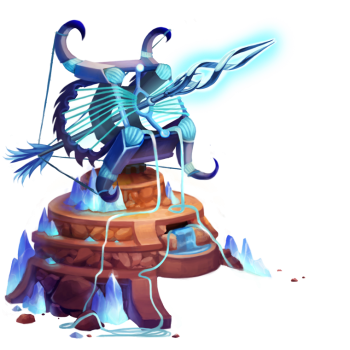 The Frosted Dragonvine Ballista Trap Skin can be used on the Dragonvine Ballista Trap trap. The trap's stats (power, power bonus, attraction bonus, etc.) are not changed. The Frosted Dragonvine Ballista Trap Skin can be purchased from the Moussu Picchu Trapsmith for 100,000 gold and 400 Dragon Scale. It can also be obtained from the Marketplace or through Give To Friends. 6 September 2017: The Dragonvine Ballista Trap was introduced with the opening of Moussu Picchu.